Access All Areas members are in for another treat this week with the latest premium design resource contribution from Trailhead Design Co. 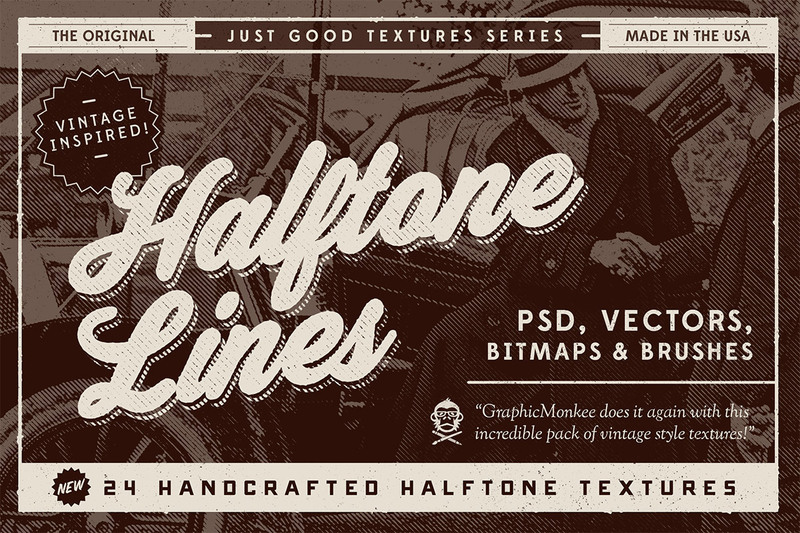 This Halftone Lines pack is a huge collection of 24 textures in PSD, Vector, Bitmap and Photoshop Brush formats to add vintage style halftone overlays and print effects to your designs. They were meticulously crafted by hand with ink on paper for an authentic and unique look. Nathan Brown is the professional designer/illustrator behind Trailhead Design Co, a brand that represents high quality design products that are intended to provide designers with a means to output their best work in the fastest most efficient manner possible. All Trailhead Design Co. items are carefully constructed, by hand, with extreme attention to detail and craftsmanship. Find out more about Trailhead Design Co. The Halftone Lines texture pack from Trailhead Design Co. contains 24 hand crafted textures in a variety of formats, including a PSD with each of the 24 textures on its own transparent layer, 24 Scalable vector textures in AI format, 24 Bitmap Tiff files, an ABR file with 16 halftone line brushes for Adobe Photoshop, and a handy Quick Reference PDF file. Overlay the textures or use them with layer masks to add gritty effects to your artwork to achieve the sought after vintage print look. I always like this kind of printing. Maybe I’ll try my hand at some of it. Thank you and thanks to Graphic Monkey!